Best advice: Don’t fall prey to over thinking things or using uncertainty as a reason to not act. There is so much we can do today and tomorrow and the day after that. Waiting for the time to be right, to be certain is folly. The multifarious problems of the world and the suffering of its inhabitants are happening now and they need our attention similarly. At the same time remember to think where you can, lest we behave thoughtlessly. Leo Biddle is dressed in black – black hiking pants, black boots and a black singlet. He’s just put out a cigarette and skulled the dregs of his strong black coffee. Shunning food – Leo says he gets the bulk of his calorie intake from beer – he strides into the jungle at Matang Wildlife Reserve in Sarawak Borneo. Pressing deeper into the filtered green light of the trees, Leo speaks to the tour group following him in rapid-fire sentences. He’s a walking encyclopaedia of biological information. His razor sharp intellect proffers fascinating insights into animal behavioural science, occasionally veering into philosophy, and always bringing the conversation back to considering conservation from a place of non-judgement, intent and consciousness. Leo has dedicated his life to wildlife rescue. He manages Matang, rescuing and rehabilitating animals with the hopeful intent of releasing them into the wild. He raises money for wildlife conservation through the charity he founded and directs, Project Orangutan. He leads a team of volunteers to care for the animals. 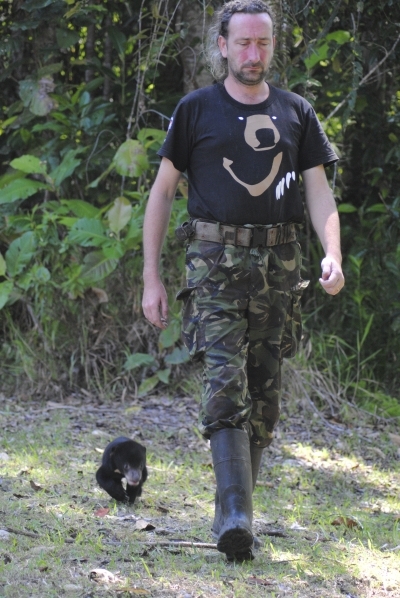 And he takes the opportunity to educate tourists about the realities of wildlife rescue and rehabilitation. There are no rose-coloured glasses for Leo’s guests. Simply the sometimes bleak and sobering reality of working to save animals racing towards extinction. Hanging out at Matang Wildlife Reserve. Later, over another strong black coffee and cigarette, Leo admits to charging into wildlife rescue quite by accident. He’d graduated from university early, having been fast-tracked through high school. He’d started a security company in the UK, working at night clubs and at events. When a mate signed up to volunteer with Médecins Sans Frontières in Rwanda during the height of the genocide in 1994, Leo signed up too. He’d use his security company to protect his mate and the other volunteers. And he’d get to enjoy a whole new experience while he was at it. As the turmoil in Rwanda eased, Leo began providing security for other causes. He lent his expertise to the Dian Fossey Gorilla Fund International’s Karisoke Research Centre and was so taken with their work that he began making ongoing donations. Soon though, he also began to establish his own group to investigate the illegal wildlife trade and thwart poachers. Over time, and between stints back to the UK to earn money, Leo became something of a freelance wildlife trafficking investigator. He’s reluctant to divulge the details of this work, saying only he did what needed to be done to provide the information necessary to prosecute illegal wildlife traffickers. He remembers being particularly invested in work to save chimpanzees. At the time the threat of HIV AIDS was sounding alarm bells across the globe and medical facilities scrambled to understand the condition. They needed subjects on which to test treatments. Their preferred test subjects? Chimpanzees. As Leo matured, he came to work in gorilla tourism. Convinced that tourism was not in the best interest of the animal, Leo sought to lessen the impact tourists visiting the ‘gorillas in the mist’ would have on the gorillas they encountered. 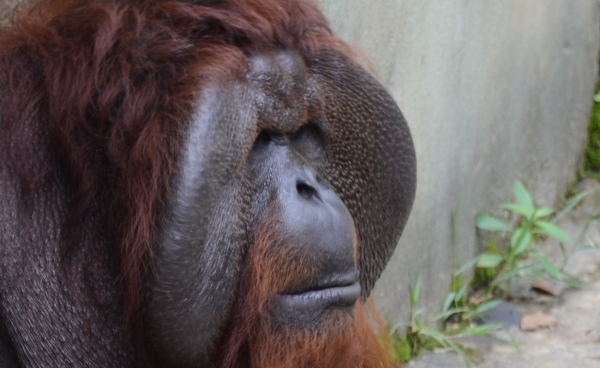 A dominant male at Matang deemed unable to released into the wild. It wasn’t long before Leo raised the hackles of those he met with his strong views against animal tourism. Fed up, a manager at Matang Wildlife Reserve challenged him to do it better. Leo took up the challenge. And he remains at Matang more than 12 years later walking the tightrope between raising money through tourism, and providing real help to native animals. While experiencing success in stamping out ‘cuddle an orangutan’ experiences and successfully releasing many creatures back into the wild, Leo was upset to realise that many of the animals at Matang will never be released. Watching the orangutans in the fenced enclosure before him, he tells a tour groups that highly intelligent creatures like orangutans quickly become habitualised to humans. Release them and they are likely to return to humans for food – an act that can have fatal consequences for the animal. Instead, those animals who’ve been in human contact are often condemned to spend out their days in captivity. While Leo and his team offer an ‘enrichment’ program in which they provide activities and entertainment for the orangutans daily, it’s no substitute for life in the wild. And, even if animals are suitable for release, there is little habitat left in which to release them. The national park surrounding Matang is already home to more orangutans than it can handle. And other areas are fast shrinking for developments and agriculture. Leo shakes his head in disappointment and moves a group of tourists to the next animal enclosure. And yet he takes pains to ensure his guests don’t judge locals harshly. He urges them to consider views from a different perspective. For some locals, killing an orangutan is no different to Australians killing kangaroos or another pest threatening their crops. And, he reminds the group to consider how far they would go if it came to life and death and a matter of feeding your family. While Leo despairs at not achieving enough, he says he could never give up on the animals in his charge. And not just orangutans, but sun bears, hornbills, and a whole suite of other creatures rescued from the pet trade, from restaurants, from burning habitats and other abuse. Moving from one enclosure to the next he points out individual creatures and relays their stories. 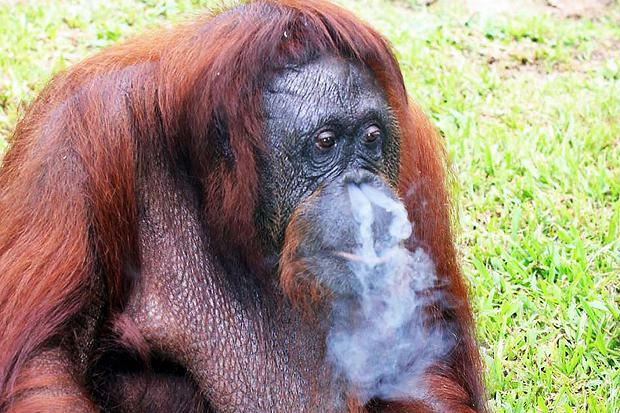 He points out Shirley the infamous, former chain-smoking orangutan who, before her rescue, would smoke up to 200 cigarettes a day to the amusement of tourists at a popular zoo on the mainland. The sad sight of Shirley smoking a cigarette before her rescue. Leo and a sun bear. Pressed to reveal his favourite orangutan, Leo (after being assured the matriarch orangutan Doris will never be allowed to read this article) admits to being smitten by a female called Chiam. “She’s super bright and I like to think we have a level of understanding between us,” Leo says. 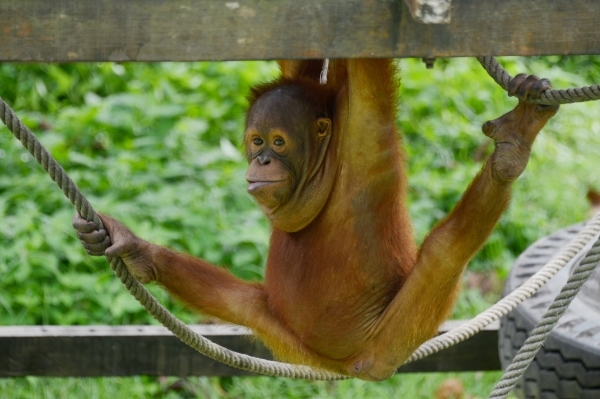 Once a young orangutan named Ting Sang became dangerously lost in the park during her rehabilitation. As the orangutan was too young to survive on its own, Leo attempted her rescue. However, after three days of searching, they found no sign of Ting Sang. Until Leo had an idea. He went to Chiam. The next morning, as they prepared to continue their search at dawn, Leo heard a screaming in the forest. He looked up to see Ting Sang racing through the treetops, screeching and swinging back towards the enclosure. Chiam had found the youngster and brought him back. So it broke Leo’s heart when he had to lead Chiam back into her cage. “I’m sad to say she’s still in that cage today,” he says. While stressed and saddened at the overall outlook for Malaysian wildlife, Leo says it’s the work with individual animals that keeps him sane. “On a microscale you can save individual animals – that’s what keeps you going,” he says. Leo also relays successes with many animals. 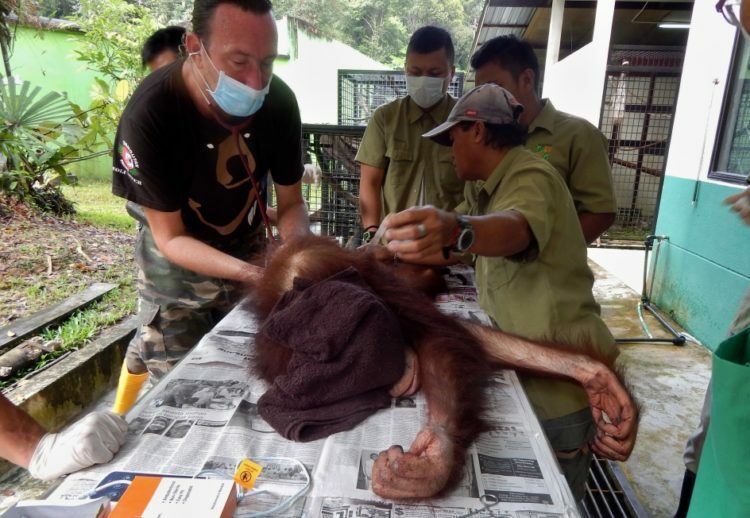 There was the orangutan rescued from its owner with a chain embedded deep in its neck. While it suffered damage to its spinal cord, the orangutan survives today thanks to veterinary care. Or there’s the orangutan they rescued at just four weeks old, burns scarring its tiny body and three bullet wounds in its chest. Incredibly the animal survived and went through Matangs’ rehabilitation program to the point it is now deemed ready for release. There’s the pangolin rehabilitation project in which this anteater – the most highly trafficked creature in the world – has been successfully released back into the wild. Or the GPS tracking of the giant Malay turtle which is providing new insights into the lives of these gentle giants. The list of successes goes on. 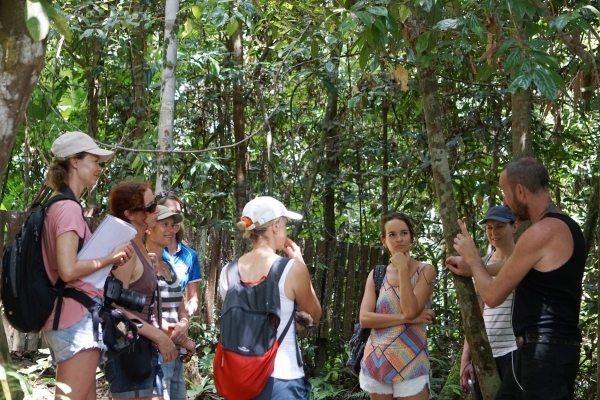 Leo addresses a tour group at Matang. 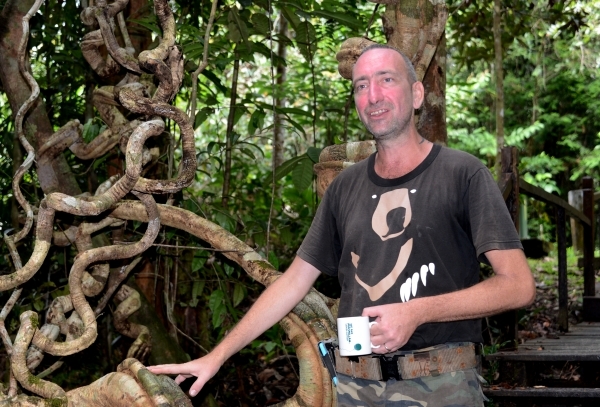 We met Leo and saw his work firsthand on an Inspired Journey to Borneo. Find out about joining Inspired Journeys here. Inspiring and very, very brave! Thank God for people like Leo!